NEW YORK CITY — Hart Island, the city’s 101-acre potter's field, has seen 850,000 burials since the city acquired the land in 1869. But trying to find out the unclaimed people buried in what is considered the largest municipal-run graveyard in the world has never been easy. The Department of Correction, the agency that runs the island, launched Wednesday an online database for the island’s burial records, according to an announcement from City Councilwoman Elizabeth Crowley, who chairs the council’s criminal justice services committee. The database, however, does not go far enough for advocates who have criticized the city for making it difficult for friends and relatives to actually visit gravesites. Laurie Grant, whose stillborn was buried there in 1994, filed a lawsuit in December challenging the DOC’s policy restricting access to graves. Visitors are restricted to a gazebo on the island rather than allowed to visit the actual burial grounds. Grant, an OB/GYN, has become a voice for the families of the 27,769 infants buried there between 1981 and 2011. She is on the board of the nonprofit Hart Island Project, which is urging the city to transfer jurisdiction from the DOC to the Department of Parks and Recreation and make Hart Island an open cemetery. “The DOC database does not make burial location information listed in the ledger books available to the public,” said Melinda Hunt, an artist who launched the Hart Island Project website in 2009, nearly a decade after publishing a book about the island. “Most people wish to visit an actual gravesite and commemorate their loved one through visitation and storytelling,” she continued. Besides stillborns, there are many immigrants and victims of crimes and disease buried there, along with homeless people, tourists and others laid to rest after their families couldn't be found or could not afford to pay for burials elsewhere. The island, sitting just east of City Island in the Long Island Sound, has been largely abandoned, save for the inmates serving short-term sentences who are bused in from nearby Rikers Island to perform daily burials at mass graves. Like many other little islands around New York City, Hart Island had been used for a host of institutions, such as an extension of a prison workhouse for boys on Rikers Island, hospitals and barracks from the Civil War that were turned over to the city, an insane asylum, and a home for victims of the yellow fever epidemic of 1870, Hunt’s 1998 book explains. The city charter that assigned DOC and the Department of Welfare, a now-defunct agency, to oversee the island has never been changed. Photos taken there by Ian Ference, who writes the Kingson Lounge blog, show the island in a state of decay and disrepair. Before the DOC’s database, Hunt’s nonprofit worked on a series of Freedom of Information Law requests to get the city to hand over the names of the people buried there in order create its own database that volunteers spent several years developing. 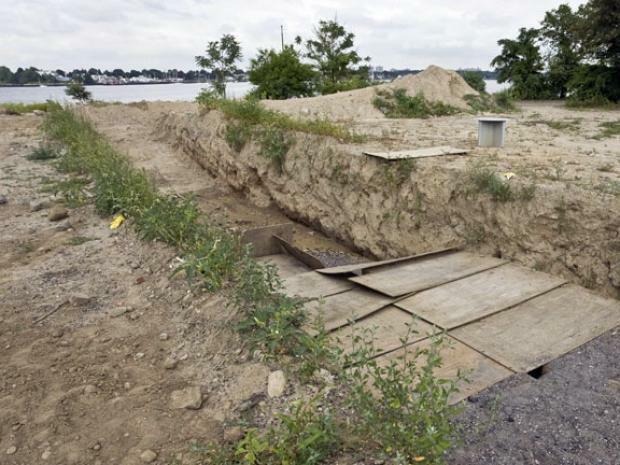 The Hart Island project is also filing a FOIL request for GPS information for the mass grave locations, in the hopes that legislation, which has been introduced, will grant public access to the potter's field through the jurisdiction change, Hunt said. The project is developing an interactive feature called the Traveling Cloud Museum that will include storytelling tied to people buried on Hart Island. It will use the plot and section information in its database linked to the GPS data, enabling the public to search grave locations on Google, Hunt explained. “It is inappropriate for the prison system to manage visitation," she said, "and block access to graves."